This homemade, zero waste cereal is one of my favorite things to make (and to gift!). I haven't found cereal in bulk that meets my standards - bulk sections usually only have sugar and oil laden granolas. So, I had to make my own. This cereal contains my favorite nutrient dense ingredients that provide fiber, plant based protein, and healthy fats (plus vitamins, minerals, antioxidants and phytochemicals). 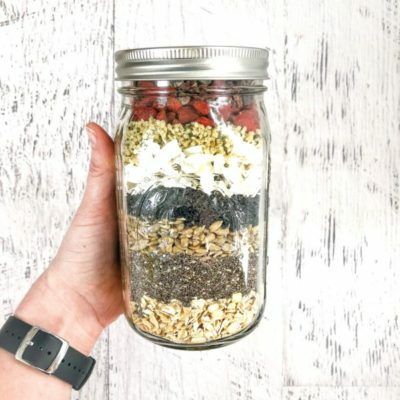 Layering these ingredients in a mason jar looks gorgeous and is a lovely DIY gift. I gave it to a family friend and she emailed me asking if she could regularly buy it from me! Because I'm not going into the cereal business (yet ;) ), for now, make it for yourself or a loved one! This recipe is vegan, gluten free, vegetarian, dairy free, and zero waste! Take out a 32 ounce, wide mouth mason jar. Add each ingredient to the jar, one on top of the other. This makes for a gorgeous presentation with all the different layers of ingredients. When ready to eat, shake it up to evenly mix the ingredients. Serve with almond milk (or let soak in almond milk in a container in the fridge overnight), or sprinkle on your favorite yogurt. Take a deep breath before enjoying this lovely breakfast.